Is it possible to write a portrait of someone who doesn’t exist? It’s not Mademoiselle London, an imaginary character, in front of me, but her creators, the art and writing team Katya Jezzard-Puyraud and Franki Goodwin, and yet she is ever present, somehow bigger than all of us. But who is she, and how did she come into being? “She’s a bit of both of us” explains Katya, the writer who gives the character words and thoughts. “And she’s also anyone who’s ever felt they don’t quite belong somewhere” chips in Franki, who creates all the artwork in Mademoiselle London’s world. Mademoiselle London is a website, happenings, poems, prose, sketches and now a book, Mademoiselle London (heart) Paris (sometimes). “Bad love affairs, bad grammar and bad hangovers”, promises the press release. The book is the opening chapter of her new life in Paris, and sees the character wresting with loneliness, language and some very dodgy characters. Underneath though there is something more tangible, something more universal. It’s a short book, attractive but dense. It’s more of an experience than a read. The book, and Mademoiselle London’s existence, is also completely bilingual. “This element is crucial to our work” says Katya “I live everyday with two languages and I think it’s important to reflect that”. Franki the artist has no such language boundaries in her work, but she still sees the beauty of the bilingual being; “the translations take the poems in different directions. She loses her language and they can become sadder, more poignant and in some cases even funnier”. It also makes their work, and Mademoiselle London’s experiences, all the more universal. And the ambition of the team in this respect is impressive. “Kat and Franki also have a crazy idea that their translated texts might somehow break down some of the language and cultural barriers that keep the English and French at loggerheads” cries the press release, before adding that “they don’t expect over six centuries of bickering to be undone by some bloody poems”. Both of the creators are, like their invention, originally from London. Paris was a dream, a distant attraction, and yet close enough to turn into a reality. Anyone who has ever attempted such a move will be familiar with the issues and emotions it entails, all of which generally boil down to one single fact – how do you find your place in this strange new world? For Katya and Franki, the answer has been through a joint creation, an individual who could encapsulate all that they had experienced. “I am very happy to hide behind Mademoiselle London" confesses Katya. "I use her to reveal all most embarrassing stories and deepest feelings. Weirdly, since hiding behind her, my words have become more visible. And this project has really helped me find a toe-hold in this city” she adds. For Franki, some of the results have been more surprising, “when you arrive anonymously in a place where you could be anyone, you actually become more yourself than ever before. I didn’t expect that”. The book is a view of Paris through Mademoiselle London’s eyes, but despite the many sketches, we never see the character herself. She is clearly though an individual who has grown through the exchanges between Katya’s words and Franki’s sketches. As Katya says,“I am always inspired by Franki’s drawings. She’s like a bottle of eye drops. She makes me see Paris clearly again”. “Our decision to work together was so seamless that I sort of forget where my early scribbles of Paris stopped and the birth of Mademoiselle London began” adds Franki. “I feel like she arrived when I did. I try not to “illustrate” in the traditional sense but match up things I have drawn with the wonderful pieces Kat has written. It’s more of a game of snap than a linear process from words to image”. Mademoiselle London may not exist, but she has clearly only just been born. Many more adventures are planned for her in her adopted city, and her two creators have very clear ideas of the directions she will take. “We will be continuing our character’s Parisian adventures with a graphic novel – a riotous night in the life of Mademoiselle London. We are also planning a line of bilingual t-shirts which will launch in the New Year. Our art and writing events will continue around Paris where we hope to get ideas from everyone involved in Mademoiselle London’s life”. Mademoiselle London (heart) Paris (sometimes) is available from a selection of stores in Paris, and online here. A really great review, Adam. You've summed things up nicely and accurately about this fun little book. Thanks for your take on it all, and I hope people will purchase and appreciate this book. 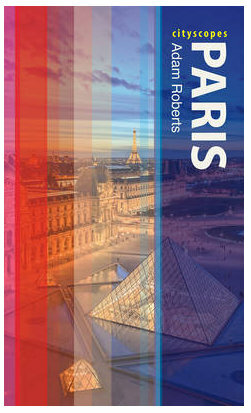 It's a good one to have in a collection of books on Paris and France! Or, if one is a young woman, as Katya put it, "who's ever felt they don't quite belong somewhere." Wonderful review, definitely makes me want to dive in!